A 54 year old man is described with signs compatible with ocular myaesthenia gravis and an apparent excellent response to pyridostigmine. Subsequent clinical progression and further investigation suggested the presence of an inflammatory brain stem lesion, which responded to corticosteroid therapy. Clinical relapse, including the development of central neurogenic hyperventilation, led to a brain stem biopsy, confirming a diagnosis of B cell lymphoma. This case illustrates the propensity of primary CNS lymphoma (PCNSL) to mimic other conditions. 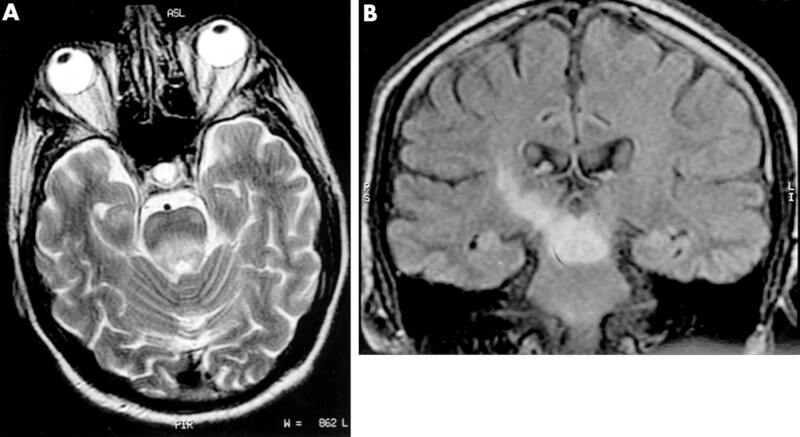 Brain MRI is mandatory in presumed “test negative” ocular myasthenia with atypical clinical findings. Spontaneous regression of PCNSL or response to corticosteroids is common and should not mitigate against the diagnosis. Histopathological confirmation should ideally be made before starting therapy, as this may obscure or delay the correct diagnosis. Although PCNSL is rare, it must be considered in all patients with brain stem syndromes, and in all patients 50 years or older with contrast enhancing focal lesions. A 54 year old white man presented with a 2 month history of constant binocular vertical diplopia, present in all directions of gaze. There was no history of limb weakness, dysarthria, or dysphagia. On examination he was found to have a partial left non-fatiguable ptosis, right over left hypertropia, and reduced elevation of the left eye in abduction. There was no nystagmus. A presumptive diagnosis of ocular myasthenia gravis was made; however, repetitive stimulation and single fibre EMG showed no evidence of a neuromuscular junction disorder and antiacetylcholine receptor antibodies were negative. Contrast enhanced CT of the head and orbits and chest radiography were normal. There was an apparent response to pyridostigmine therapy and the symptoms resolved over the next 3–4 months without treatment. Eight months later he re-presented with diplopia and gradual onset left sided numbness and weakness. He also complained of unsteadiness of gait, slurred speech, and difficulty in swallowing. There was no fever, weight loss, rash, or orogenital ulceration. On examination he was dysarthric but not aphasic. There was a right over left skew deviation in all horizontal gaze positions and loss of ocular vergence. There was almost complete loss of vertical eye movements, particularly upgaze, which were improved with a vertical doll's head manoeuvre. Horizontal saccades were slowed bidirectionally. There was a left upper motor neuron facial palsy, an impaired gag reflex, and palatal elevation on the same side. There was hypertonia of left upper and lower limbs, and associated left sided pyramidal weakness, brisk reflexes, and a left extensor plantar response. A left spinothalamic hemisensory loss was found which also involved the face. Gait ataxia and dysmetria involving the right arm and leg were present. Two months before the initial presentation he had taken a short vacation to Vietnam but had not had any ill health. There was a 1 year history of depression treated with citalopram. No relevant family history was obtained. T2 weighted (fig 1⇓ A) and fluid attenuated inversion recovery (FLAIR) (fig 1⇓ B) MRI of the brain showed a confluent high signal lesion extending from the posterior aspect of the pons and tectal plate through the posterior aspect of the brain stem and cerebral peduncle to involve the right thalamus, posterior limb of the internal capsule, and the corona radiatus. After administration of gadolinium nodular enhancement was seen in the pons and cerebral peduncle. There was a mild mass effect associated with the lesion. Examination of CSF disclosed a raised protein of 1.26 g/l, normal glucose, and no oligoclonal bands. The CSF contained 2 white cells/mm3 with reactive morphology and there was no growth after culture. All routine blood tests including erythrocyte sedimentation rate and serum electrophoresis were normal except for a mild hypogammaglobulinaemia. (A) Axial T2 weighted and (B) coronal FLAIR MRI showing the extent of abnormal high signal involving the posterior brain stem extending into the right thalamus. The patient was started on a 3 day course of intravenous methylprednisolone followed by oral corticosteroids. One week after starting treatment, his diplopia, gait, and speech had improved and there was increased velocity of saccadic eye movements. However, within 3 weeks he had returned to the pretreatment neurological state despite continuing steroid therapy and repeated falls resulted in a fractured distal fibula. The patient's family reported a change in affect and neuropsychological tests indicated mild intellectual underfunctioning and frontal lobe dysfunction. A whole body gallium scan and CSF ACE concentrations were normal. Mantoux test (1:1000/10 units) was unreactive (as expected after steroid therapy). Syphilis, lyme, rickettsial, treponemal, schistosomal, legionella, mycoplasma HIV and HTLV1 serology, CSF polymerase chain reaction for JC virus and Whipple's disease, and an autoantibody screen were negative. One month after initial presentation there was severe spastic dysarthria with slow tongue movements, brisk jaw jerk, bilateral facial palsy, and loss of the gag reflex. There was bilateral hypertonia, ankle clonus, pyramidal weakness, brisk reflexes and extensor plantar responses. Bilateral appendicular ataxia was now present. Recurrent aspiration secondary to progressive dysphagia necessitated nasogastric feeding. Repeat MRI of the brain showed progressive disease despite steroid therapy and CSF protein had increased further to 1.97 g/l. A stereotactic biopsy was advised but refused and treatment was continued with 60 mg prednisolone daily. The patient subsequently developed involuntary hyperventilation. On examination he was apyrexial, alert, and oriented. The respiratory rate was 23/minute, regular and unaltered during sleep. Arterial blood gases showed respiratory alkalosis (pH 7.58, pCO2 2.24 KPa, PO2 16.2 KPa, HCO3 16 mmol/l, base deficit −2.3 mmol/l). Chest radiography was normal and there was no evidence of pulmonary embolism on spiral CT of the thorax. A third MR scan of the brain was unchanged. Finally a stereotactic biopsy was performed and a diagnosis of B cell lymphoma made. The patient continued to deteriorate and in view of his poor clinical condition neither chemotherapy nor radiotherapy were recommended. He died within 2 months of his admission. Primary CNS lymphoma represents less than 2% of all brain neoplasms and 1%–2% of malignant lymphomas.1 Most are B cell NHL, and may present as single or multiple lesions involving the eye, leptomeninges, or brain parenchyma. Parenchymal lesions are often adjacent to the ventricular or ependymal surface, and 10%–29% are infratentorial. Localisation primarily in the brain stem occurs in 3% of PCNSL, and most are T cell in origin.2,3 The current case is an unusual presentation of primary brain stem B cell non-Hodgkin's lymphoma, which was initially misdiagnosed as ocular myasthenia on the basis of clinical findings, normal CT of the brain and orbits and an apparent response to pyridostigmine. Spontaneous regression in immunocompetent patients has been reported in PCNSL and may be due to a cell mediated immune response against the tumour, as is reported in the paraneoplastic syndromes.4 A similar phenomenon is seen after reduction in drug induced immunosuppression in organ transplant patients with lymphoma.5 Spontaneous PCNSL regression has led to confusion with multiple sclerosis,6,7 and may explain the apparent response to cholinesterase inhibition seen in this patient. “Test negative” myasthenia gravis is well recognised, particularly in cases of isolated ocular myasthenia, and may mimic other conditions affecting extraocular muscle function. This case is an example of a condition simulating myasthenia and provides an argument for MRI of the brain in all patients with atypical ocular findings. Steroids are cytotoxic to malignant lymphocytes and regression of PCNSL after short term therapy is well described, with marked decrease or complete radiological disappearance of the tumour in more than 40% of patients.8,9 In this case, steroids resulted in a short lived neurological recovery; PCNSL may imitate multiple sclerosis or sarcoidosis in this regard. If PCNSL is considered in the differential diagnosis, histopathological diagnosis should if possible be established before starting steroid therapy, as it may obscure the diagnosis and delay appropriate therapy. Our patient initially declined stereotactic biopsy on the basis of his initial improvement with steroid therapy, which gave both him and the treating physicians false hope that the lesion was inflammatory in nature. Radiological appearances, which are disproportionately worse than expected from the clinical findings, are characteristic of PCNSL,10 and in retrospect may have provided an early clue to the diagnosis in this case. Primary central nervous system lymphoma is a rare condition; however, it must be considered in the differential diagnosis of all brain stem syndromes. Brain MRI is mandatory and must be interpreted in the context of the clinical picture. The extraordinary frequency of primary cerebral lymphoma among the few patients with tumour induced central neurogenic hyperventilation suggests that lymphoma must be high in the differential diagnoses and should guide therapy. If the diagnosis of PCNSL is entertained steroid therapy should be avoided and early histological confirmation sought but often, as in this case, biopsy may be undesirable when a temporary response to steroids is found and because of potential complications. Finally, spontaneous clinical or radiological improvement, or improvement after steroid therapy should not mitigate against the diagnosis of PCNSL. Villegas E, Villa S, Lopez-Guillermo A, et al. Primary central nervous system lymphoma of T-cell origin: description of two cases and review of the literature. J Neurooncol1997;34:157–61. O' Neill BP, Illig JJ. Primary central nervous system lymphoma. Mayo Clinic Proc1989;64:1005–20. Murray K, Kun L, Cox J. Primary malignant lymphoma of the central nervous system: results of treatment of 11 cases and review of the literature. J Neurosurg1986;65:600–7. Lucchinetti CF, Kinnel DW, Lennon VA. Paraneoplastic and oncologic profile of patients seropositive for type-1 antineuronal nuclear antibodies. Neurology1998;50:652–7. Starzl TE, Porter KA, Iwatsuki S, et al. Reversibility of lymphomas and lymphoproliferative lesions developing under cyclosporin-steroid therapy. Lancet1984;17:583–7. Kuroda Y, Kawasaki T, Haraoka S, et al. Autopsy report of primary CNS-B-cell lymphoma indistinguishable from multiple sclerosis: diagnosis with immunoglobulin gene rearrangements analysis. J Neurol Sci1992;111:173–9. DeAngelis LM. Primary central nervous system lymphoma imitates multiple sclerosis. J Neurooncol1990;9:177–81. Hochberg FH, Miller DC. Primary central nervous system lymphoma. J Neurosurg1988;68:835–53. DeAngelis LM, Yahalom J, Thaler HT, et al. Combined modality therapy for primary CNS lymphoma. J Clin Oncol1992;10:635–43. DeAngelis LM. Primary central nervous system lymphoma. J Neurol Neurosurg Psychiatry1999;66:966–701. Pauzner R, Mouallem M, Sadeh M, et al. Arch Neurol1989;46:510–12. Plum F, Swanson AG. Central neurogenic hyperventilation in man. Arch Neurol Psychiatry. 1959;81:535–49. Rodrigues M, Baele PL, Marsh HM, et al. Central neurogenic hyperventilation in an awake patient with brainstem astrocytoma. Ann Neurol1982;11:625–8. Krendel DA, Pilch JF, Stahl RL. Central hyperventilation in primary CNS lymphoma: evidence implicating CSF lactic acid. Neurology1991;41:1156–7.